OPAS are pleased to have been appointed as an authorised UK distributor for true VELCRO® brand products. 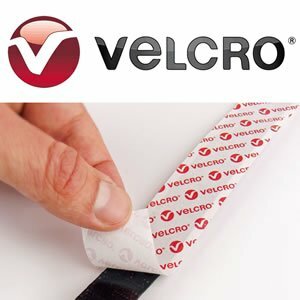 Velcro® Brand woven hook and loop tapes consist of minute flexible hooks or mushrooms, which engage with a mating woven, knitted or nonwoven loop tape comprised of small soft loops or yarns and are available with a variety of adhesive peel-and-stick adhesive backing to best fit your application. These HOOK 88 and LOOP 1000 products have a pressure sensitive rubber-based adhesive backing and are recommended for most substrates. It is high tack, quick setting and reaches 90% of bond strength in an hour of application. Call 01903 239 955 or request an estimate online. Please note this offer subject to VAT and standard carriage. To order these items add to your quote request and we will contact you with price including carriage, packing and VAT.